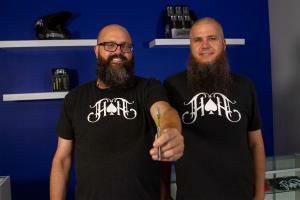 LOS ANGELES, CALIFORNIA, UNITED STATES, September 12, 2018 /EINPresswire.com/ -- — Iconic cannabis brand Heavy Hitters has announced a limited release collaboration with Beard Bros. Pharms to produce one gram cartridges of their famed Extreme Cream strain. Beard Bros. Pharms, known for their cannabis cultivation expertise, prides itself on its reputation for having the best phenotype of Extreme Cream on the market. Heavy Hitters, recognized for its high quality oils and vape technology, was a natural fit for this limited release product. This collaboration marks the first and only Extreme Cream vape cartridge ever to be sold in California. "We are so excited to be bringing this limited release collaboration to market from two powerhouse cannabis brands," said Hannah Davis, Chief Marketing Officer for Mammoth Distribution, Heavy Hitter's distribution partner. "We’re partnering with these two best-in-class companies to give cannabis connoisseurs a unique, one-of-a-kind experience." Bill Levers of Beard Bros. Pharms said, "We’re super stoked to be part of this. Our choice to collaborate with Heavy Hitters was an easy one. Their quality, consistency and potency is something we strive for in our work and we’ve always respected what they do. Their team is able to keep all the unique effects and nuanced taste profiles we worked so hard to develop in our Extreme Cream strain. We can’t wait to share this collaboration with all our favorite dispensaries and fans." The limited release one-gram cartridges will be dropping in mid-October at select cannabis distributors across the state of California. Check HeavyHitters.co for availability at release. Growing some of the finest craft cannabis in Southern California, brothers Bill and Jeff of Beard Bros. Pharms have also earned a reputation as outspoken advocates of the cannabis plant, and all of the benefits that it offers. As staunch supporters of organizations like Parents4Pot.org, FreedomGrow.org, and WeedForWarriors, Beard Bros. Pharms recognizes their role in the cannabis community and uses their platform as often as possible to help those less fortunate.